Cook one serving of quinoa according to the directions, set aside. Heat the pan until a splash of water sizzles. Cook the onions in a little water or vegetable broth until translucent. Add the frozen broccoli and cauliflower. Put the lid on until the broccoli and cauliflower are not frozen (3 minutes). Add fresh asparagus and cook until all veggies are a little tender but still bright. Throw the scallions in at the last minute, stir them into the vegetables. 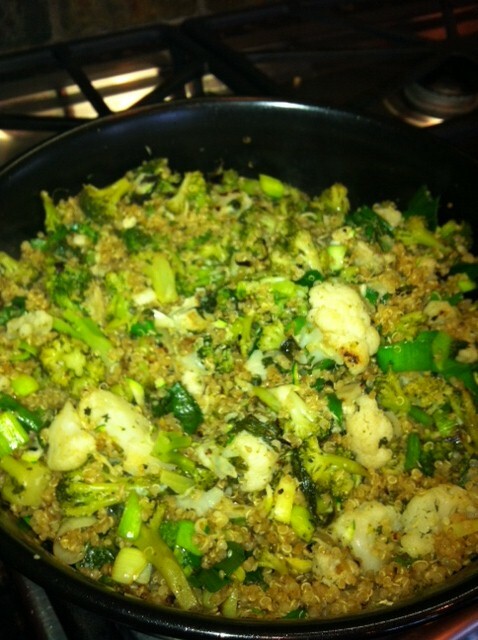 Mix the quinoa into the veggies that are still on the stove top. Turn the heat off. Pour the sauce over the quinoa vegetable mix, coat thoroughly and serve. Got to try this! Looks amazing. Any particular reason why frozen broccoli? I just keep tons of bags of frozen organic broccoli stocked because it is a great value and I use 1-2 bags a day. Thanks for the swift response! Looking forward to trying this one! This looks fantastic, I will be trying this out for sure! Maybe I can finally transition from cold quinoa dishes to hot. This looks super tasty! It’s not hard to make at all. Good luck!